Shimla: To form a new Joint Venture Corporation (JVC) named as ‘Himachal Pradesh Solar Power Corporation Ltd’ for Implementation of Solar Power Project in the State, the Himachal Pradesh Electricity Board Limited (HPSEBL) has signed an agreement with Solar Energy Corporation of India (SECI), Ministry of New and Renewable Energy (MNRE), today. 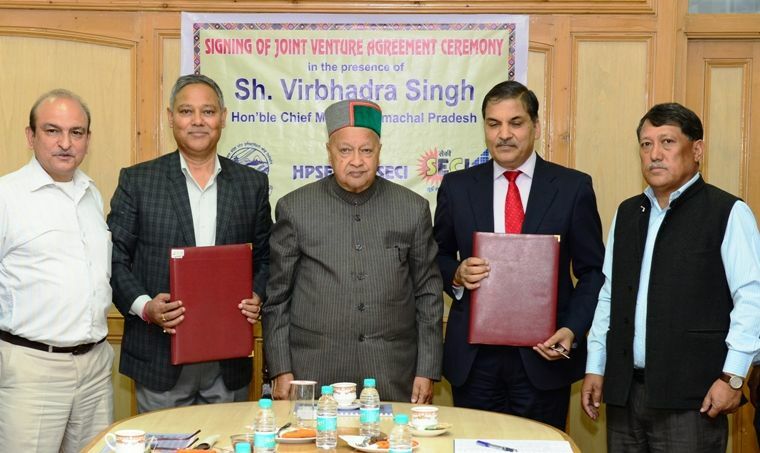 The Agreement was signed by Managing Director, HPSEBL, PC Negi on behalf of the State Government and by Ashwani Kumar, Managing Director SECI on behalf of GoI, in the presence of Chief Minister Virbhadra Singh. Under the Agreement, a pilot Solar Wind Hybrid Power Project of 2.5 MW would be set up at Rangrik in Kaza in Lahaul and Spiti district for which completion target had been set up somewhere between September and October, 2017. The project will be first of its kind in India, which will synchronize solar, wind, hydroelectric project with grid supply with the help of large energy storage system. On completion, it would benefit as many as 12,000 habitants of Rangrik, Kaza, Tabo, Losar, Pin valley and other nearby areas. However, the foundation stone of the Solar Project was laid by Chief Minister in June, 2015. The total estimated cost of the project is Rs. 30.72 crore out of which 50 percent of the equity share will be provided by SECI (Ministry of New & Renewable Energy) and 50 percent by HPSEBL. The Project is expected to generate approximately 4.41 million units annually, constituting 3.32 million units by PV modules and 1.09 million units by wind turbines and can also supply power from the back up battery in absence of grid supply. Apart from this Project, setting up Solar Parks, Solar Power Projects and other projects in the Renewable Sector, as may be feasible, shall also be set up in other parts of Himachal Pradesh. Chief Minister congratulated the HPSEBL and SECI for the initiative and said that the project, apart from hydel power generation in the State would add to the additional power and would open up more avenues in Solar and Wind Power sector in times to come.